TORONTO – Jermaine Gabriel’s invite to the CFL Combine in Toronto is more than just a routine football trip. For the 23-year-old defensive back, the visit to Toronto is an opportunity to return to the city he previously called home. Following the conclusion of his high school football career, Gabriel attended Bishop’s University in Sherbrooke, Quebec where he spent two seasons from 2009-2010 as a member of the Gaiters football program. In his sophomore season, Gabriel recorded 35 tackles, four forced fumbles, eight pass knockdowns, and two-interception returns for touchdowns. During the 2010 CIS off-season, Gabriel joined the Calgary Colts of the Canadian Junior Football League. The CJFL provides the opportunity for young men aged 17-22 to participate in highly competitive post-high school football in Canada. Gabriel spent just one season with the Colts where he was named Prairie Conference MVP and earned All-Canadian honours. In his first visit to Toronto in over a year, Gabriel will attempt to impress coaches, general managers, and scouts ahead of the May 6 CFL draft. 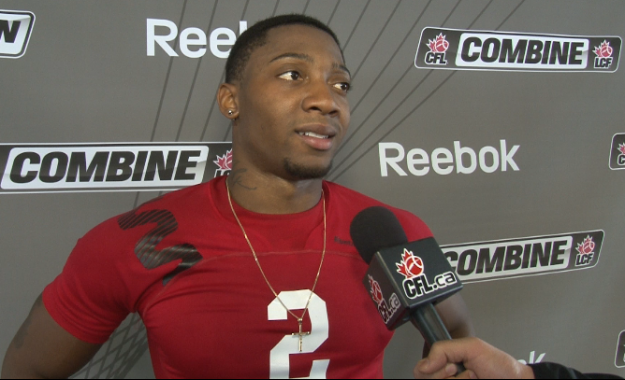 The versatile defensive back hopes that his junior football success will translate into an opportunity in the CFL. Gabriel’s blazing speed and tremendous athleticism was on full display at the Edmonton Regional Combine. Gabriel ran an outstanding 4.75 in the 40-yard dash, ranking first amongst fellow defensive backs. His 40-inch vertical jump also ranked first at the combine and his broad jump of 9 feet, 9 and a half inches ranked second amongst the defensive backs in attendance at the combine. Gabriel is glad to be back in Toronto and acknowledges how fortunate he is to have earned the golden opportunity to compete at the CFL Combine. Gabriel credits the Canadian Football League for their exceptional work in expanding the scouting process, allowing individuals such as himself to showcase their abilities in the presence of CFL general managers, coaches, and scouts. Despite the long-shot odds Gabriel faces as a player from the CFL’s first-ever regional combine, the 23-year-old is optimistic regarding his opportunity in Toronto and is looking to put everything on the line in an attempt to earn recognition for the upcoming CFL draft. Above all, Gabriel’s trip back home to Toronto will certainly be memorable and by the end of the weekend, he hopes to have made positive strides in his search for a future career in the CFL.